A two year project to repeat a famous bird survey by driving over 20, 000km in a 4x4 across Botswana has confirmed researchers' fears: many birds of prey are fast disappearing from one of Africa's last great wilderness areas. Reported sightings of iconic species of eagle and vulture declined by as much as 80% compared with the previous survey, while some migrant species recorded last time have vanished, according to the study published this week in the international scientific journal Biological Conservation. 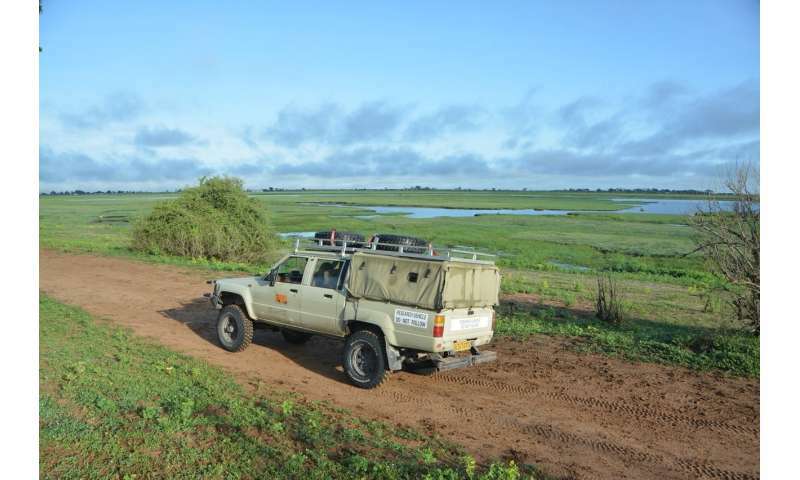 The data is based on a return trip to a network of roads criss-crossing most of Northern Botswana, an area first surveyed over twenty years ago by a former Wildlife Biologist with the Department of Wildlife and National Parks Botswana, Dr. Marc Herremans. Researchers retraced Herremans's route across gravel and tar roads in a similar vehicle to the one he used and driving at the same speeds. They spotted birds with the naked eye, only using binoculars to positively identify bird species—as per the original survey. The resurvey focussed on 29 raptor species and compared their encounter rate with Herremans's original records. "The main motivation for doing the work was to explore whether vultures and other raptor numbers had declined in Botswana like they have in many other areas of Africa" says Associate Professor Arjun Amar from the Fitzpatrick Institute of African Ornithology at the University of Cape Town which conducted the study in collaboration with conservation NGO Raptors Botswana. 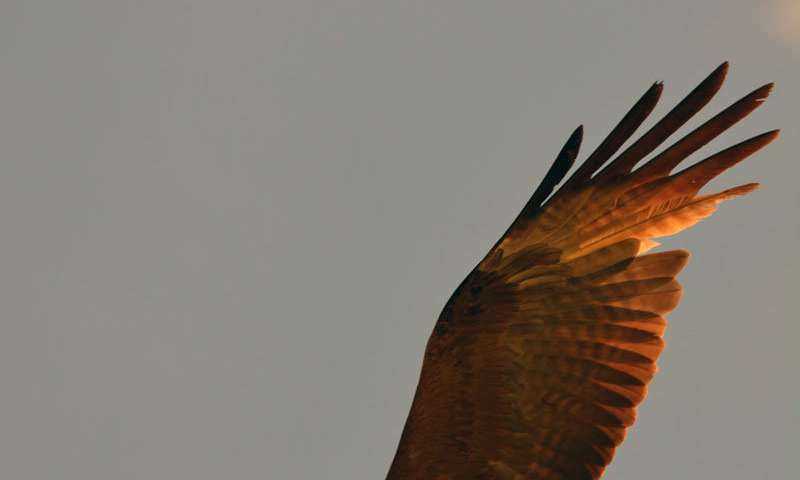 Amar, who supervised the research, says the sharp decline in sightings is unexpected: "Although declines in raptor populations have been seen elsewhere in Africa, particularly across West Africa, we were not expecting these declines to be quite so dramatic in Botswana which has a relatively low human population size and where nearly 40% of the land is under some form of protection" Species declines were detected for 14 out of 29 species monitored. Eleven of these species declined by over half in the last 20 years. Some of the species showing the greatest declines are the White-headed and Lappet Faced vultures, African Hawk Eagle, Secretary Bird, Bateleur Eagle, and Red-necked Falcon. Only three species showed an increase in their abundance: the Brown and Black Chested Snake-eagles and the Tawny Eagle. The study does not pinpoint the cause of the declines. However, conservationists say vultures in particular are vulnerable to poisoning by poachers for whom the birds' habit of circling carrion is a threat—because it might draw attention of game rangers inside protected areas. 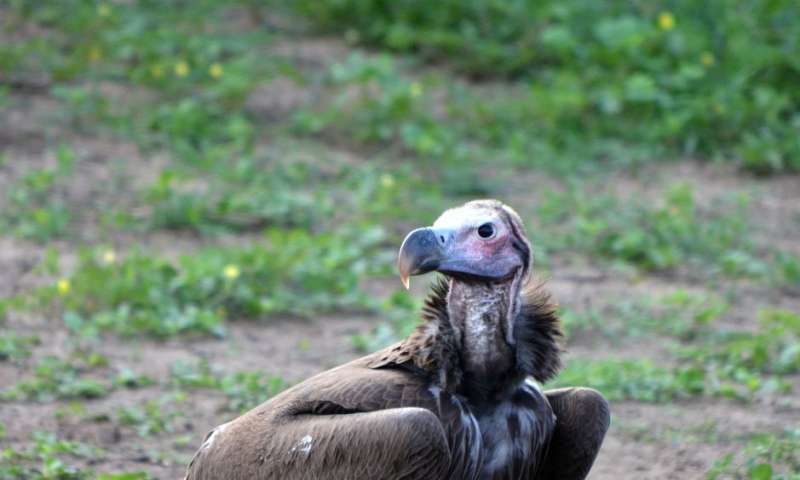 Another recent study found a third of all vultures caught and tested in a separate Botswana study showed elevated levels of lead in their blood mostly likely due to ingesting bullet-contaminated flesh. Beckie Garbett, a Ph.D. student who led the latest road transect study, says: "We found declines occurring across species with varying diet and habitat use, which make it hard to pinpoint the main drivers of decline." "Climate change is one candidate for these declines, but urgent research is needed to better understand the drivers of these declines," Garbett says. The roadtrip study also found significant declines of many species inside protected areas. In other words the main factors driving species decline transcend habit conservation status. "Our study shows that drivers of decline are apparently indiscriminate, inexplicit and are likely acting jointly, making defining appropriate conservation measures challenging," the authors said in their study summation. The study findings also highlight the importance of historical data in countries where scarce funding resources result in limited species monitoring. The sharp declines contained in the latest survey would not have been observed without reference to Herremans's original survey, which actually covered a much wider area—about 50 000km of road. The repeat study concentrated only on the northern transects. Researchers would now like to repeat the remaining routes in the South of the country to explore whether these trends in the north represent the overall trends for the species in the country. Herremans said he was pleased that his data had proved valuable "and that they contribute to our knowledge of long-term changes in bird populations." " It is sad though to learn that even in this country with so much of the land devoted to conservation, biodiversity is in steep decline," Herremans said.He said the survey had helped combat fatigue during his epic journey: "It helped us to stay focused (and awake!) during our extensive travels through the country." Botswana, with a population of only 2,3-million, is considered one of the most scenic countries in the world due to the combination of the Kalahari desert, pristine bushveld, and the world famous Okavango Swamps. However surveying the terrain is not without its challenges; the research team averaged speeds of only 20kmp/h for sand and gravel roads. Individual transect routes ranged from 65km to 585km due to the vast distances involved. In addition distances between the first and second surveys varied slightly "due to changes in road networks over time and due to interpretation of original transect route descriptions (no GPS coordinates were available 20 years ago during the original surveys)", the study says.